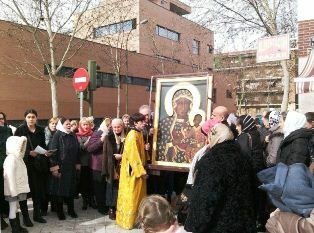 On Sunday morning, February 10th, the Częstochowa Icon visited a Russian Orthodox Church. The Church of the Birth of Jesus is located at Gregorio Vacat Street number 16 in Madrid and is being extended now. The faithful had been waiting for the arrival of a very sacred object – The Czestochowa Icon, called “The Undefeated Victory”, whose original, according to the Church tradition, was written by St. Luke the Evangelist, a physician and the first icon-writer. For the welcome they sang the hymn dedicated to the Mother of God venerating in the Częstochowa Icon “the Victorious Queen”, and next the choir performed the Akatyst in honour of the Mother of God. Next the Divine Lithurgy started. The lithurgical prayer lasted for two hours, as it is always the case in the Orthodox Church. The homily was preached by the pastor archipriest Andrey Kordochkin in two languages: Russian and Spanish. He pointed out what are the things most closely connecting the Orthodox and Catholic churches. These are: The Virgin Mary venerated in Her sacred Icon, persecution for the faith during the communist terror time, and nowadays nagging those who side with the defence of life. 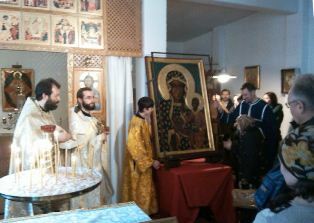 After the Holy Lithurgy the crowd of the faithful waited patiently in a queue to have a possibility to approach the Icon in person and with personal prayer “touch” the Icon.